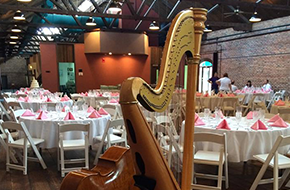 Have A Harp provides beautiful music for special events such as weddings, receptions, and more! Make your special event even more memorable and beautiful with that added bit of class so unique to the harp. Be entertained by all kinds of music highlighted by the harp! The Spraus provide fun and fascinating musical education programs for both adults and children … all about the harp and revealing that almost any music can be played on the harp! You, too, can learn to play an exhilarating glissando … on the spot! 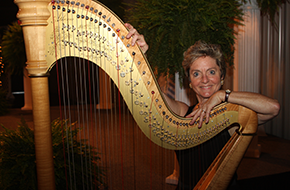 Have A Harp will entertain and relax guests with a wide variety of beautiful and fun music played on the harp! Do you sometimes wish the musicians would “mix it up” and play some different kinds of music? 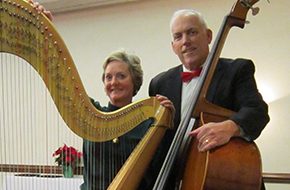 If you like a variety of genres, you will love Have A Harp: We have talented and gracious musicians, harpist and string bassist, in Greenville, NC and the surrounding area. We get many positive comments regarding our repertoire and can play a variety of Latin, Irish, jazz, classical, spiritual, pops, Broadway, and music written specifically for the harp by experienced harp composers and arrangers. For nearly 20 years, we have been providing entertainment for weddings, banquets, receptions, birthday parties, anniversaries, church events, musicals, cantatas, corporate events, funerals, memorials, and much, much more! The melody of a harp playing softly in the background of your first class event will add sophistication that no other live performance artist can bring. We revel in music and people. We love what we do. We can help set the desired mood and atmosphere for your particular event. If you are not familiar with the harp, you owe it to yourself to hear a sample of our amazing music! Think of all the elegant and classy events you have seen on film and TV. How many times have you seen these elegant events or dinners accompanied by beautiful tones being plucked from the strings of a harp? Give us a call today!